Get a sense of the local culture at Kariye Museum (The Chora Church) and Ortakoy. 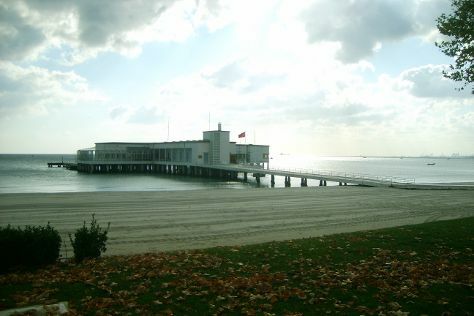 Take a break from the city and head to Florya Sahil Parkı and Solar Plajı. Next up on the itinerary: take a stroll through Istiklal Street, admire the striking features of Eyup Sultan Mosque (Eyup Sultan Camii), appreciate the extensive heritage of Pierre Loti Tepesi, and pause for some serene contemplation at Santa Maria Draperis Church. To see photos, other places to visit, more things to do, and more tourist information, read our Istanbul trip itinerary maker site . Venice, Italy to Istanbul is an approximately 6-hour flight. You can also drive; or do a combination of train and bus. Traveling from Venice to Istanbul, you'll lose 2 hours due to the time zone difference. August in Istanbul sees daily highs of 34°C and lows of 25°C at night. Finish your sightseeing early on the 14th (Tue) so you can travel to Selcuk. On the 15th (Wed), look for gifts at La Tulip Art Gallery, delve into the distant past at Heracles Gate, delve into the distant past at Arcadian Way, then examine the collection at Camlik Locomotive Museum, then take a stroll through Sirince Koyu, and finally delve into the distant past at Cathedral of St.John the Evangelist. To find more things to do, photos, maps, and tourist information, read our Selcuk tour itinerary builder app . Getting from Istanbul to Selcuk by combination of flight and train takes about 5 hours. Other options: do a combination of bus, flight, and train; or drive. Expect a bit warmer weather when traveling from Istanbul in August: highs in Selcuk hover around 41°C, while lows dip to 26°C. Wrap up your sightseeing on the 15th (Wed) to allow time to drive to Marmaris. Start off your visit on the 16th (Thu): look for gifts at Latina Goldsmith, stop by Kurt Jewellery, stop by Trust Gold & Diamonds, then stop by Pasha Fine Jewelery, and finally see the interesting displays at Kapurcuk Kultur ve Gastronomi Evi. To find ratings, traveler tips, and tourist information, read our Marmaris trip itinerary planning app . You can drive from Selcuk to Marmaris in 3 hours. Alternatively, you can take a bus. When traveling from Selcuk in August, plan for little chillier days in Marmaris, with highs around 38°C, while nights are about the same with lows around 24°C. Wrap up your sightseeing on the 17th (Fri) early enough to ride a ferry to Rhodes Town. You'll enjoy a bit of beach vacationing at Stegna Beach and Nikolas Beach. Get some cultural insight at Mandraki Harbour and Street of the Knights. Venture out of the city with trips to Monastery Tsambika (in Kolimbia), The Church of the Panagia (in Lindos) and Marias House (in Embonas). There's still lots to do: kick back and relax at Agathi Beach, tour the pleasant surroundings at Oasis Beach, take in the architecture and atmosphere at Church of Our Lady of Filerimos, and explore the galleries of Kahal Kadosh Shalom Synagogue. 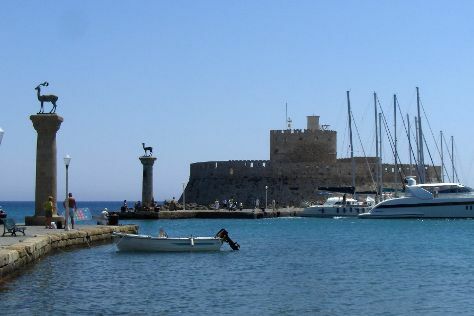 Plan my day in Rhodes Town using traveler tips and tourist information provided by Inspirock. You can ride a ferry from Marmaris to Rhodes Town in an hour. The time zone difference when traveling from Marmaris to Rhodes Town is minus 1 hour. Traveling from Marmaris in August, you can expect nighttime temperatures to be a bit warmer in Rhodes Town, with lows of 29°C. Finish up your sightseeing early on the 20th (Mon) so you can travel to Rethymnon. 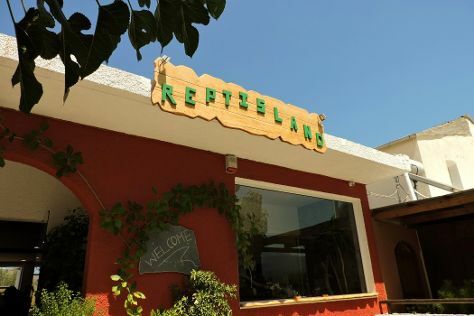 On the 21st (Tue), delve into the distant past at Ancient Eleutherna, then explore the fascinating underground world of Melidoni Cave, then identify plant and animal life at Reptisland, and finally enjoy the sand and surf at Varkotopos Beach. Get ready for a full day of sightseeing on the next day: soothe aching muscles at some of the top local wellness centers, then stop by mariannas, and then look for all kinds of wild species at Kourtaliotiko Gorge. For photos, other places to visit, where to stay, and other tourist information, use the Rethymnon trip planner . Do a combination of flight and bus from Rhodes Town to Rethymnon in 5.5 hours. Alternatively, you can ride a ferry; or do a combination of ferry and bus. Traveling from Rhodes Town in August, you can expect nighttime temperatures to be slightly colder in Rethymnon, with lows of 26°C. Finish up your sightseeing early on the 22nd (Wed) so you can travel to Oia. Mnemossyne Gallery and Domaine Sigalas are good opportunities to explore the local culture. Deepen your sense of the past at sights like Byzantine Castle Ruins and Orthodox Metropolitan Cathedral. 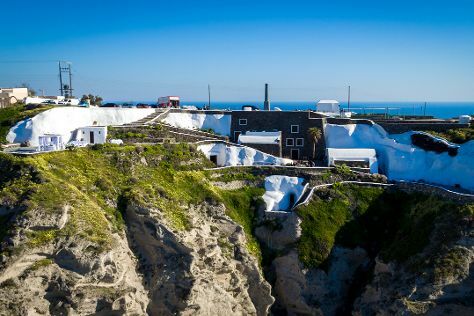 You'll find plenty of places to visit near Oia: Wine Museum Koutsogiannopoulos (in Fira), Cultural Village (in Pyrgos) and Venetsanos Winery (in Megalochori). There's lots more to do: look for gifts at Aquamarine Jewelry, pause for some serene contemplation at Cathedral of Saint John the Baptist, relax and rejuvenate at some of the top local wellness centers, and take in the pleasant sights at Oia's Main Street. To see more things to do, ratings, reviews, and more tourist information, read Oia holiday planner . You can ride a ferry from Rethymnon to Oia in 3 hours. In August, daily temperatures in Oia can reach 36°C, while at night they dip to 28°C. Finish your sightseeing early on the 25th (Sat) to allow enough time to travel back home.